Netflix is still our all time favourite streaming platform, especially when it comes to the best TV shows on offer right now. It has such a huge range of TV shows, including originals, exclusives and lots of classic seasons too. With such a vast selection of shows to choose from, it can be tricky to work on which is the best Netflix series to watch, especially because it's always being updated with shows both old and new. We've put together this guide to the best Netflix shows that you can watch in the UK right now – and so you can keep up-to-date with Netflix's busy release schedule, which we'll be updating you on once a week. 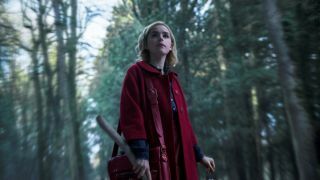 There's a great selection of new shows to watch on Netflix this month, including the second season of The Chilling Adventures of Sabrina, which is even stronger, darker and spookier than the first, plus the David Attenborough-narrated Our Planet to tuck into. Then there's a lot to look forward to later in the year too. The third season of GLOW will land at some point before the end of Summer 2019 and fans of Stranger Things will be happy to hear that Netflix has now confirmed the highly-anticipated third season will arrive on July 4 2019. We're also looking forward to the third season of The Crown, which will be hitting our screens this year. It's set to return with an all new cast, with Olivia Coleman starring as Queen Elizabeth II as the series moves onto the next chapter of her reign. News has also been revealed this week about The Witcher TV show. The Netflix adaptation of The Witcher game and book will be released before the end of 2019, the company has confirmed. In movie news, the Jurassic Park trilogy is also now available on Netflix. Check out our roundup of the best movies on Netflix UK for more excellent film choices. Now that Apple has released its own streaming service, Apple TV Plus, and Disney's offering, Disney+ is coming soon, will Netflix still remain the best of the bunch? Only time will tell. In the meantime, check out Apple TV Plus vs Netflix for more information on the fledgling platform.